Welcome to the forum. Would be helpful if you can tell us what bandsaw you have and the size of the sleepers. I personally wouldn't even attempt to try and cut 4" thick green oak on that bandsaw - particularly not 8' lengths. Why not just buy some 1" sawn boards? I think your bandsaw may not cope too well if used for cutting deep section oak railroad sleepers. 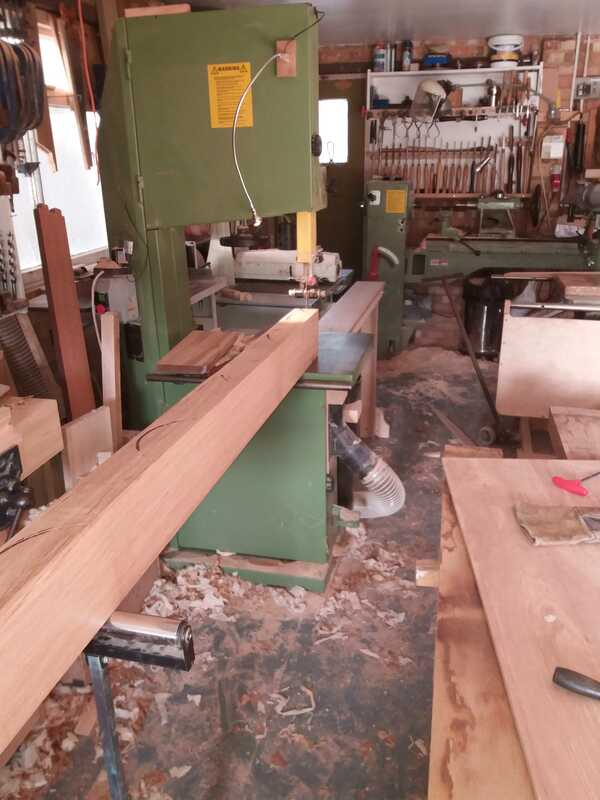 The type of bandsaw you have will not have the motor or bandsaw frame construction for this type of heavy work and I would look to take them to a local sawmill for re-sawing. I have worked in two professional workshops that had bandsaws that would cope with this type of work (re-saws), they are much heavier saws standing about 10' tall with heavy castings and wide blades so very different to the one you have. If you still want to go ahead I'd make additional stands either side of the bandsaw to help steady the sleepers while you cut them down. I would also contact the bandsaw manufacturer and ask for their advice regarding the best blade to use with your bandsaw. The attached was resawing kiln dried 6" and 8" euro oak 8' long. the machine is a Meber 500 with a approx 20" throat and 12" depth of cut, single phase with a 2hp motor. I use a 3/4" 3tpi M42 cobalt blade for this type of work, you want a blade with few teeth, the reason being that as the material passes through the blade the gullets fill with sawdust which can't be released until the tooth exits the material therefore once the gullet is full it stops cutting and the friction heats up the blade. You can sometimes see evidence of this after the cut by a tapered tooth pattern where the teeth are cutting at the top of the timber but not the bottom. large resaws such as stenners have a powerfeed so feed speed on these machines are dictated by the machine. I agree with the others your saw will struggle with what you want to do especially in green oak. finally if you do attempt it clean out the dust straight away, I have cut green oak on this saw and left an offcut on the table. within 20 mins the tannins in the oak started rusting the top and needed cutting back with a piece of wet and dry. katellwood wrote: The attached was resawing kiln dried 6" and 8" euro oak 8' long. the machine is a Meber 500 with a approx 20" throat and 12" depth of cut, single phase with a 2hp motor. 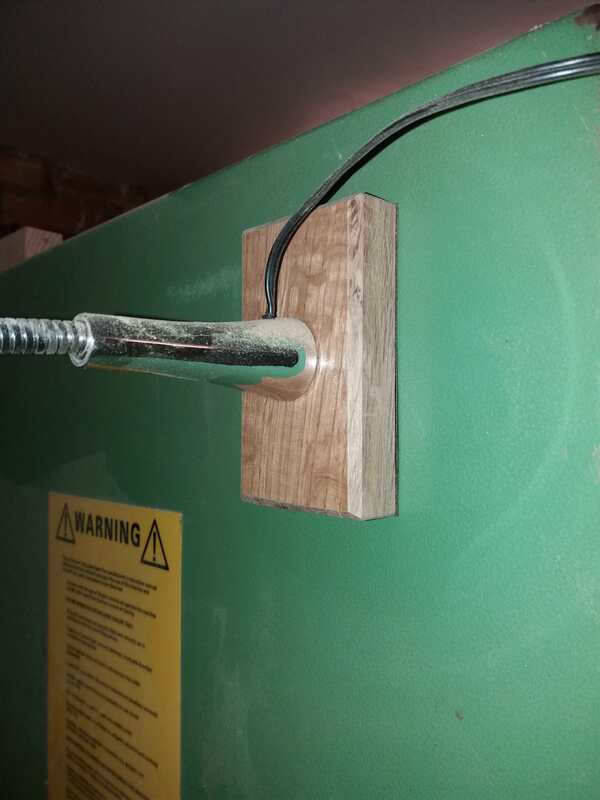 Stenner Band-Re-saw would cut through this in about one minute your Bandsaw 20+ I'd say.............? Chris - what is the light that you've used to shione on the workpiece please? It looks similar to something from Ikea. I've replaced the supplied weighted base with a piece of timber and super-glued two 25mm rare earth magnets into the new base. Thanks Chris. 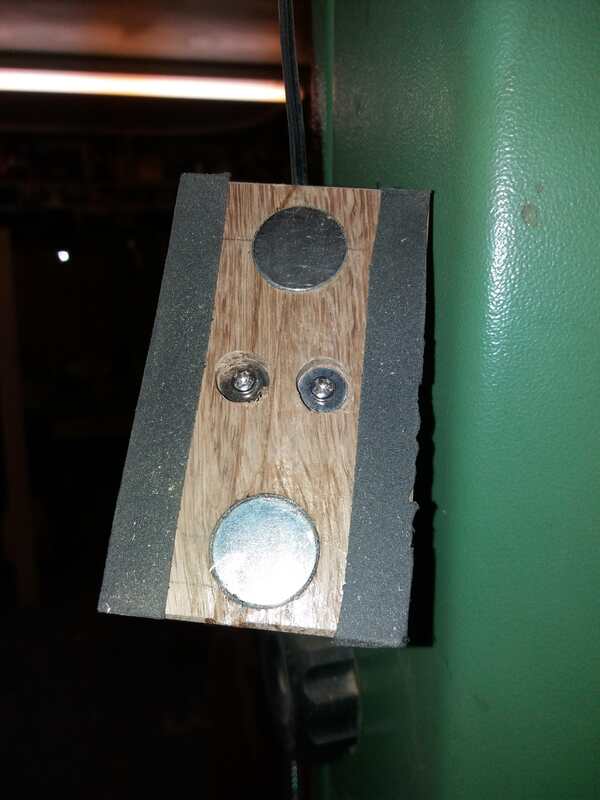 I've added a couple of these to my Xmas list for bandsaw and router table. 2-3 minutes is Much quicker than I thought. Perhaps I should buy some blades like you as I have some odd blocks of oak that I could convert for draw sides. Got to be worth doing if only a few lengths involved I'd think. The steel used is apparently supposed to stay sharp 8-10 times longer than conventional blades. i bought it specifically for this purpose. The stock I purchased was 85mm thick and my finished size was 60mm, I didn't want an extra 20mm going up the dust shoot as chippings. It has now given me some lovely 1/4 sawn stock that i can use for drawer sides boxes etc. Its a handy blade to have available for this type of work.